Strip Fill Foundations: Is there a better option? Strip foundations are a fairly rudimentary type of shallow foundation that are used to provide a continuous, level (or sometimes stepped) strip of support to a linear structure such as a wall or closely-spaced rows of columns built centrally above them. Strip foundations can be used for most subsoils, but are most suitable for soil which is of relatively good bearing capacity. They are particularly suited to light structural loadings such as those found in many low-to-medium rise domestic buildings – where mass concrete strip foundations can be used. Problems arise with Strip foundations due to the masses of excavation required, the minimum width of strip foundations is dictated by the total weight bearing they will encounter as well as the type of ground they are being used in. This means it’s completely conceivable that the excavation of earth could take a long time and the removed matter will have to be disposed of. On unstable ground this could be many tonnes of waste. With the advances in technology there have systems created that are much more effective, such as Housedeck. 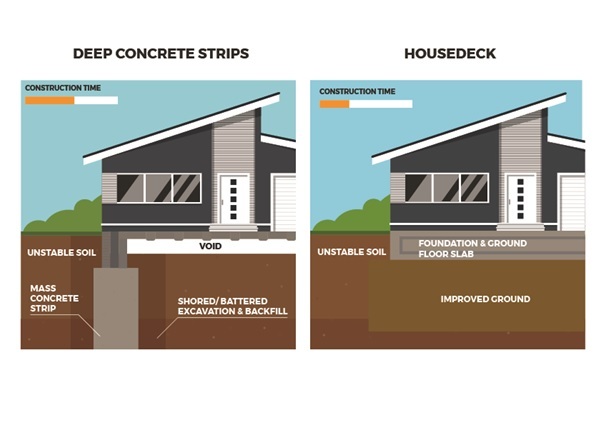 Through the use of innovative ground improvement techniques, Housedeck is a cost effective, safer and quicker alternative to strip or trench foundations. Sites that expect obstructions; we often have the ability to move piles within the slab area to avoid obstructions, thus saving time and cost. Housedeck is a proprietary foundation system and replaces the need for traditional strip foundations or for pile & beam along with the associated brickwork and sub-flooring; improving quality, reducing costs and construction times on your site.How does Housedeck work?